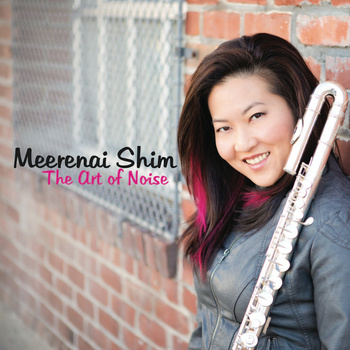 Following up on her 2011 debut, “Sometimes the City is Silent,” Meerenai Shim’s “The Art of Noise” includes works written in the past five years. Composer Luigi Russolo’s book The Art of Noises (1913), which encourages composers to use all possible sounds, is the starting point for Janice Misurell-Mitchell’s contribution to this album; both Misurell-Mitchell’s piece and this album’s title were adapted from the title of Russolo’s book. Shim’s collaborators include Lori Lack on piano, Paul Rhodes on cello, and Christopher G. Jones on percussion. Digital audio as well as sounds from a Nintendo Game Boy are also featured. The first work on this album, Daniel Felsenfeld’s To Committee: A Self Parody, features a thick, textured flute sound from Shim. The flutter tonguing used occasionally also adds to the dense texture. Shim’s articulation is clear and even. Perhaps most impressive is Shim’s ability to create a wide variety of tone colors through, but not limited to, various speeds of vibrato including none at all. Janice Misurell-Mitchell’s work for flute/voice and percussion, The Art of Noise, creates an interesting sonic landscape where there is plenty of conversation between the flute and an array of percussion instruments. A collection of extended flute techniques, including percussive tonguing, timbral trills, and singing while playing adds to the overall sound of this work. Jay C. Batzner’s Mercurial appears in the middle of the recording and is a work built on contrasts. It begins with a reflective, long melody in the flute over an electronic drone. The digital sounds carry on relentlessly during the highly-rhythmic middle section, while the flute has much longer gestures. Eventually the flute adopts that driving rhythm before it returns to the longer, more reflective melody at the end, this time without the electronic accompaniment. Perhaps the biggest sonic surprise on this recording is Matthew Joseph Payne’s flight of the bleeper bird, which is a piece with incredible energy. This chiptune work is for flute and a Nintendo Game Boy; the Game Boy has four voices; the flute is treated as a fifth voice and almost becomes a part of the device. This piece also includes samples of Shim’s playing, which are played back by the Game Boy. The last piece on this recording, moonwave, is a fitting end. After more intense works, this one is more quiet and introspective. It is also for solo flute, so the texture is simplified. Meerenai Shim is quite good at creating various tone colors that complement whatever instrument she is playing with, whether it is cello, percussion, piano, or even Game Boy. The diversity of the works included on this album ensures that the listener’s attention will never wander. Shim took some risks with this album, and it paid off in a big way. I look forward to her next project. This review was originally published in the August 2013 issue of The Flute View magazine. Subscribe here!